Xiaomi finally took the ribbon off the Mi Note 2 today. Right off the bat, we can’t fail to mention the phablet has taken more than a few pointers from the now late Samsung Galaxy Note7 and frankly, the timing couldn’t be better. The Mi Note 2 comes with a stylish dual-curved design on both the front and the back. Furthering the similarities with the aforementioned Samsung device, the Mi Note 2 also has a 5.7-inch OLED, panel, curved on both sides. Since we are talking about a true flexible panel here, not just some optical trickery, we have to wonder if the panel itself isn’t actually sourced from Samsung. However the panel resolution is FullHD rather than QHD as the rumors suggested. 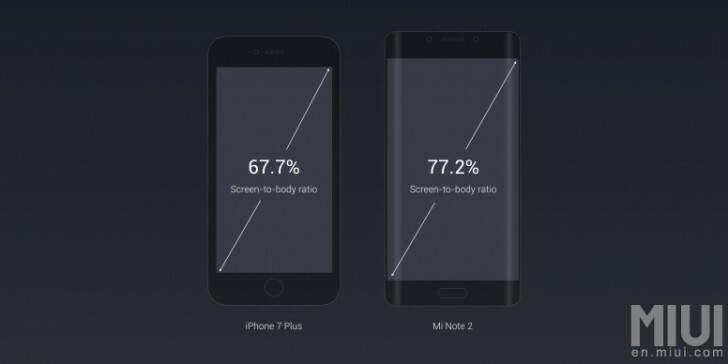 With a 77.2% screen to body ration, the Mi Note 2 appears quite impressive on renders and there is little to frown at in the rest of the specs too. The phone is powered by Qualcomm’s latest Snapdragon 821 SoC with a max clock speed of 2.35GHz. It is working in tandem with up to 6GB of LPDDR4 RAM and as much as 128GB of snappy UFS 2.0 storage. 4GB of RAM and 64GB of storage is the other available option. As for the camera, the Chinese OEM has skipped on a trendy dual-camera setup. Instead, it has gone for a 22.56MP Sony IMX318 Exmor sensor with a f/2.0 lens. The main shooter also has EIS digital stabilization for video capture all the way up to 4K. It works through a dedicated 3-axis gyroscope and promises excellent real-time jitter compensation. 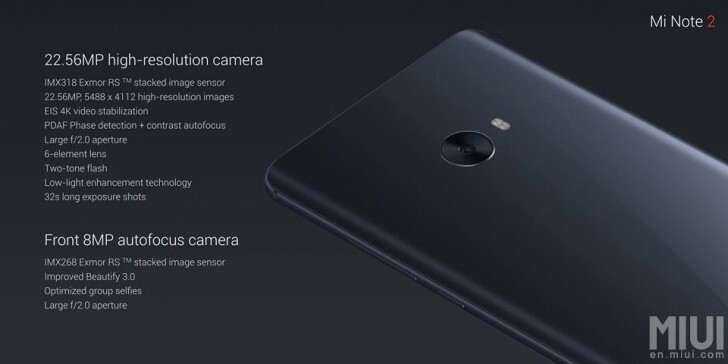 You also get the benefits of a hybrid PDAF and contrast autofocus system, dual-tone LED flash and Xiaomi’s proprietary low-light and long-exposure technologies. On the front side of the Mi Note 2 there is an 8MP shooter with a Sony IMX268 sensor. Unlike most selfie cameras currently on the market, it is not a fixed focus module and comes with autofocus. 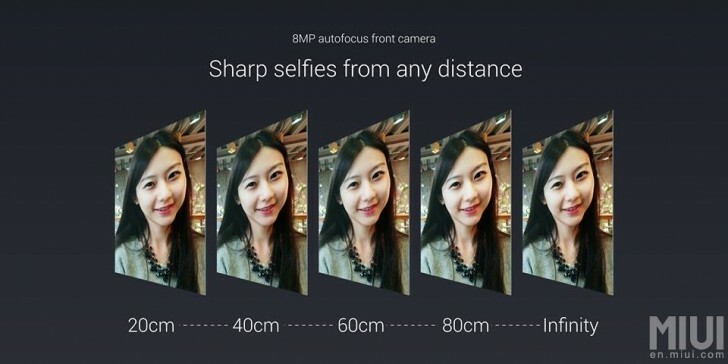 It has an aperture of f/2.0 as well and a few additional Xiaomi optimizations, like improved group selfies and Beautify 3.0. 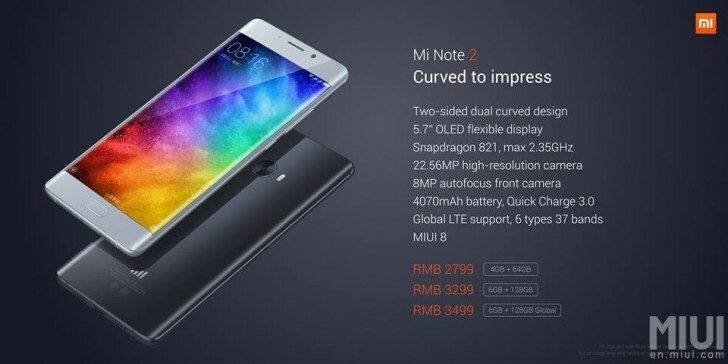 The Xiaomi Mi Note 2 is well equipped in the connectivity department as well. 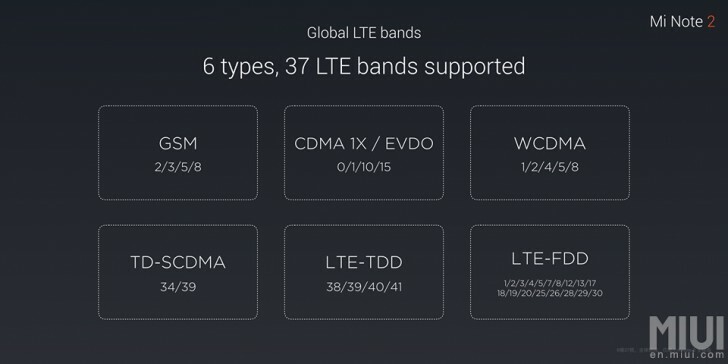 It offers global LTE support across 6 network types and a total of 37 bands. There is a high-precision GPS module inside and a fully functional NFC module. The latter enables P2P communication, but also reading, writing and card emulation, which will definitely be handy for many in a modern NFC access control work spaces and homes. 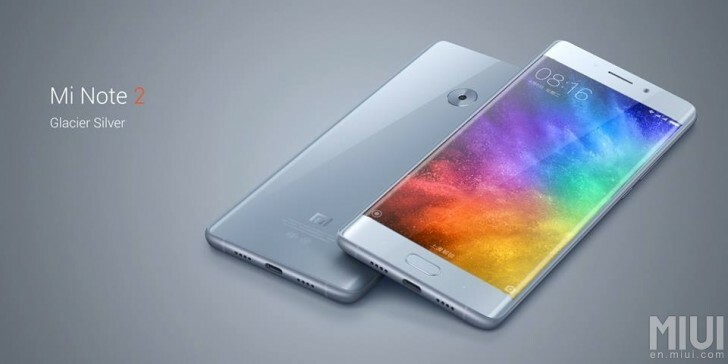 As already mentioned, the Xiaomi Mi Note 2 will come in a couple of varieties. The top of the line model has 6GB of RAM and 128GB of storage. It will sell for CNY 3299 ($485) in its home market and CNY 3499 ($520) for the global version, complete with Google Play Services. And if you want to save a few bucks, in the low end there is a 4GB plus 64GB model for CNY 2799 ($415).